People love to make lists. There’s something about writing down the things that are in our heads. We enjoy the satisfaction of crossing them off and we berate ourselves when our lists are not accomplished. The thing about productivity is that it doesn’t happen on its own. We have to do certain things in order to be productive. We need tools, like lists, to help up achieve our goals and move our visions forward. A list alone won’t get it done though. As a matter of fact a list might do more harm than good in the wrong format and with out a clear, larger picture. Below are the three steps you need to take when making a list. If you do these three things you will have a tool at your disposal that will increase your productivity by leaps and bounds. The principles are simple, time tested and easy to incorporate. One of the main problems we have with lists is that they are everywhere. We write them on napkins, scraps of paper, backs of receipts, in our phones, in text messages to other people, dry erase boards at work, bulletin cork boards and home and any where else we can come up with. This mass of disorganized thoughts, “to-do’s” and “don’t forgets” lead to things falling through the cracks and getting missed. The first step is organization. An unorganized list is an un-accomplishable list. Our first step is to choose one tablet, preferable where the paper is not removable, this will be our Tickler Tablet. This tablet becomes the list of all lists because it’s the only place where you make a list. It’s a huge growing list that never stops. Every day you will add to and remove from this tickler tablet and everyday you will know exactly where you are on your goals/projects and exactly where you need to pick up the next day. No questions to ask. No forgetting what you were supposed to do. Everything is in this tablet. A. Don’t try to section the pages of the tablet off for certain things. There is no “Work” section, “Home” section and so forth. That defeats the purpose. Remember, this is one long list that is reorganized daily. Things will be crossed off. Things will be added. If you must organize by subjects I encourage you to color code your list. Give each topic/subject a color and write that item in it’s coordinating color. The only caviat here is that color coding means having a legend in your tablet and having those pens with the tablet at all times. B. You will be writing across the pages instead of from top to bottom of one page. This tactic allows for space to think. Space to think when writing down what you must accomplish in order to move your vision/dreams forward is priceless. Writing across two pages gives you that space. The left page will be for the task item the right page will be for notes that refer to that task. This gives room for your task to develop such as space to write down talking points if you need to make a phone call. Also it allows you to return back to these notes for reference in the future. The space could also allows you to develop an idea that occurs to you through out the day. #2. 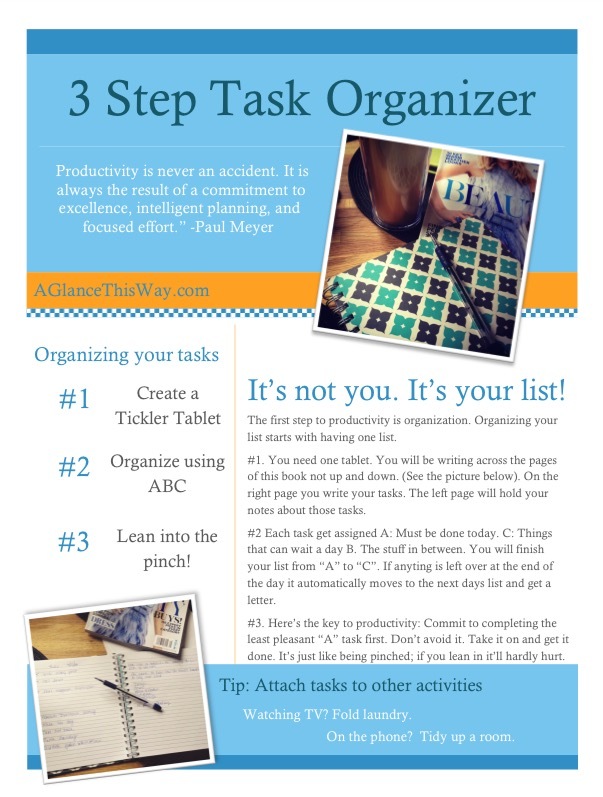 Organize your task list using ABC. Leave some space in the outer right page margin for this lettering. Be sure to assign everything a letter at the moment you write it down. This process will keep you focused and will increase productivity. If you want to get important things done this is the process for that. At the end of your day you will reorganize your lettering system so that items that need greater or less importance are properly labeled. This takes just a minute or two. The great thing about it is that you don’t have to wonder what’s on your agenda for the next day! You know exactly what to do as soon as your feet hit the ground. That’s a great feeling. Lastly, I believe that sneakiest anti-productivity habit we have is “well intentioned avoidance”. There is something on our list that we are avoiding. Usually its because we are stuck in some sort of way. Either we don’t know how to approach it or we don’t know how to solve a problem that has risen regarding the task or even that we simply don’t like doing it, so we freeze. We do 11,567 other tasks and avoid the one task that we don’t really want to touch. The problem is that the one task we don’t want to touch is the one that weighs on our sense of accomplishment the most. That tasks sits there, unaccomplished and it undermines what we have accomplished. Whether we want to admit to it or not our psychological morale plays a huge part in our productivity and a task that’s wagging its imaginary finger in our faces is bad for moral. I suggest that you face it head on. “G up”, as they say. Get some grit about yourself and face the task first. Don’t avoid it. Is it an uncomfortable phone call? Dial the number first thing in the AM! Is it a project with a know-it-all team member? Schedule your team meeting as your first task of the day. I say this because if you face the yuckiest thing first, chances are that’ll be the yuckiest thing you do all day! The rest of the day is a breeze. So lean into the pinch, it’ll hurt less if you do. Once you’ve identified that task that you’ll face head on in the morning put a little note beside it that eggs you on. Something like “Who Gon Stop Me? ?” or “Pivot! Pivot!”. Whatever get your blood going! I’ve made a printable “Cheat Sheet” of this process for you. I included some extra tips on the sheet so please download it and enjoy it. Also, drop some tips for us in the comment section below. We’d love to hear what works for you. Next Post An Affirmation for Recovering People Pleasers.